The Bio Force will help you strengthen exactly the muscles your sport demands. The Bio Force multi-gym was designed knowing that all men are looking to build strong arms, a broad chest and V-shaped torso. Cables let you target each muscle group and vary your training. By adjusting resistance and reps you can build muscle mass or increase your muscular endurance. We’ve assembled the best exercises for men. We women look to the Bio Force multi-gym to tone our whole body, build slender arms and legs and tighten our glutes. The wide variety of cable exercises and high reps will help you sculpt each muscle and improve your stamina. We’ve assembled the best exercises for women. The Bio Force is also great for training in pairs, be it with a partner or working with a personal trainer. Each of the two cables can be operated separately and set to different resistance levels. And why else would we provide two extra ankle sleeves? We’ve assembled the best exercises for training in pairs. 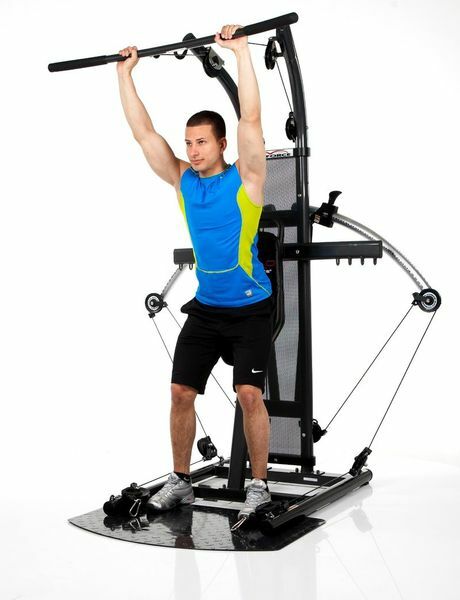 The FINNLO Bio Force multi-gym is your ticket to comprehensive and highly specific strength training. Bio Force cables simulate just about every sport movement, letting you train each muscle. This makes the multi-gym also appealing to athletes training for a specific sport. Why just build raw muscle strength, when the Bio Force multi-gym lets you optimally tailor your training to your sport of choice? Discover the possibilities for your sport and use the Bio Force multi-gym to dial in even better performance during competition. 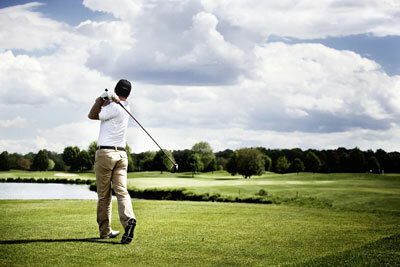 Germany’s more than 700,000 golfers can’t be wrong - golf is a great sport. It combines precision, technique, strength and concentration like no other sport. Strength training on the Bio Force can improve your golf game by helping you build an extremely stable core as well as the powerful and agile shoulder girdle the sport demands. Cross-training on the Bio Force multi-gym will help keep you fit to take on the challenges of golf no matter what age. This will improve your technique, increase your driving distance, raise your muscle stamina and minimize injuries. Clip the cable to a crossbar hook and grip the handle with both hands. 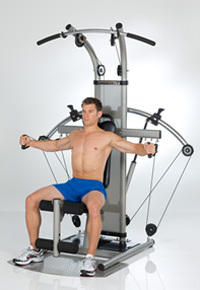 Firmly position yourself sideways in front of the Bio Force with your upper body turned slightly toward the machine. Keeping your core firm, rotate your upper body away from the Bio Force while keeping your arms at shoulder level. Briefly hold this position and then slowly rotate back. Set resistance so that you can properly perform 15 reps per side. 3 sets per side with a 1-minute rest between each. 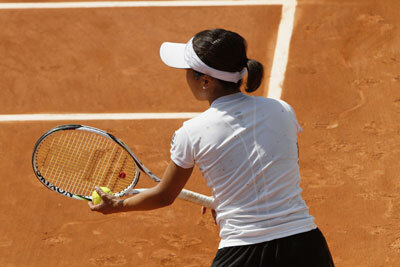 Tennis combines speed and endurance, strategy and competition, power and finesse. This technically challenging sport with rapid changes in direction demands all of the body’s muscles and is especially tough on the joints (ankles, shoulders, etc.). 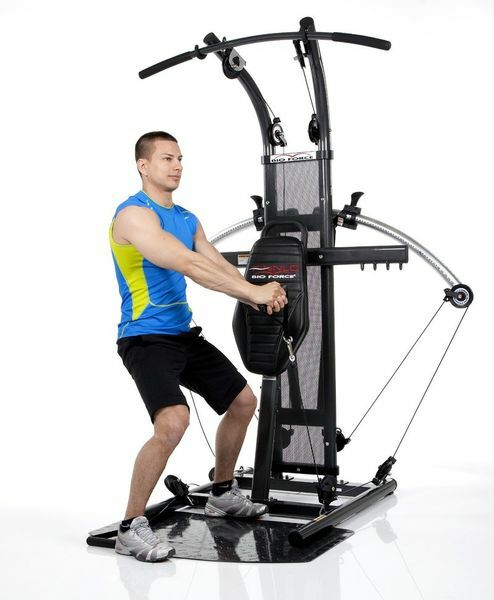 Systematic strength training on the Bio Force multi-gym will strengthen your joints and counteract the strain playing tennis inflicts especially on your dominant side. This will improve your technique, increase your swing power and improve your stamina. Strengthening your muscles will also stabilize your joints to help you minimize injury. 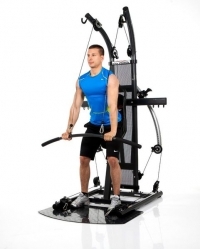 The Bio Force multi-gym is great for strengthening your shoulder girdle and improving core stability. Clip the pulley to a crossbar hook and stand perpendicular to the Bio Force with your feet at hip width. Grip the handle with your outside hand at bellybutton level. Tighten your core and guild your arm diagonally to shoulder level. Do not extend your arm fully. Briefly hold the tension and return your arm to the starting position in a controlled manner. Clip the pulley to a lower hook. Pull the cable diagonally from below using both hands. Gliding over the water, being one with nature, driving the body at top speed may explain the fascination with rowing. This endurance sport has been around for thousands of years and is one of the healthiest sports period. 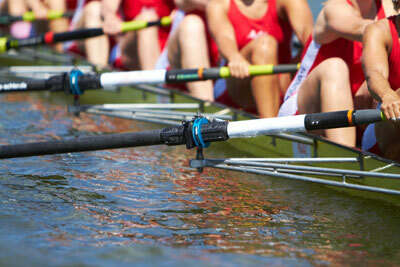 Its even and zero-impact movements make rowing injuries very rare. Even so, rowing requires a strong back and powerful arms. If you want to increase your speed, maximum power and endurance, the Bio Force is your ticket. The cables are ideal for training your biceps, triceps, back and shoulder muscles to meet the demands of your sport and let you train at different angles. 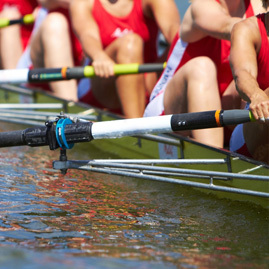 This will put more power and speed in your stroke and increase your rowing stamina. Clip the pulley to the crossbar and grip the handle with your outside hand. Keep your arm slightly bent. Assume a firm stance at an angle in front of the Bio Force and tightly grip the seatback with the other hand. Now tighten your arms and back and firmly pull the handle toward your chest. Then slowly return the handle to the starting position in a controlled manner. Two-armed rowing with two handles, seated rowing with frontal pull (both hands on a handle). 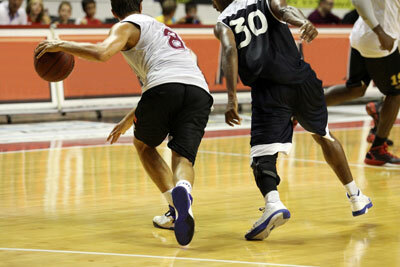 Over 250 million worldwide people play basketball. Its popularity has also skyrocketed in Europe – and not just since German basketball star Dirk Nowitzki. 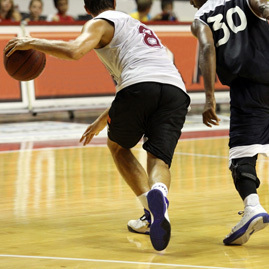 Basketball is an extremely athletic whole-body sport that demands performance from the extensor muscles in the legs and glutes, the arms and back. The need to elegantly defy gravity makes strength training a key component of basketball training. Increased muscle mass will make you more intimidating on the court, powerful legs will let you jump higher and stronger biceps will improve your passing and shooting. The Bio Force will help you get all of these results. Doing its cable exercises will also increase your upper body stability - the key to your shot. Systematic strength training will refine your technique and boost your muscle stamina when the game is down to the wire. Assume a strong stepping stance with your back to the Bio Force (remove seat if necessary) and grip the lat bar overhand at chest height. Bend your elbows, while keeping your upper arms close to your body. Now tighten your abs and arms while pressing both hands down to your thighs in a controlled manner. When you reach the final position, your arms should be slightly bent and your elbows should not move. Briefly hold the position and slowly raise your upper arms. 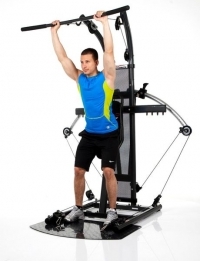 Overhead triceps extensions with back to multi-gym. As water is an element of life, swimming is deeply ingrained in us and remains one of our most popular leisure activities. In water we feel weightless and seem to glide effortlessly. 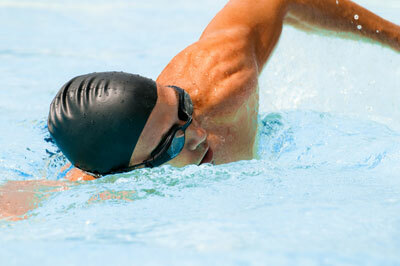 While movement in water is gentle on the joints, an ambitious swimmer needs powerful arms and legs and a strong back. With cables that help you simulate swimming on dry land, the Bio Force multi-gym will help you get these results. The Bio Force will let you systematically train performing swimming-specific movements at different resistance levels so you can optimize your performance in the water and increase your stamina. At the same time, cable-based strength training will strengthen your core, thereby improving your form and reducing drag. Assume a stable stepping stance with your back to the Bio Force multi-gym and grip the lat bar overhand with both hands at head level. 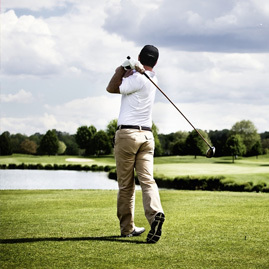 Keep your back straight and tilted slightly forward and your arms slightly bent. Now guide both arms straight down to your thighs in a controlled manner. Hold the position briefly and slowly raise your arms back to the starting point. Perform the extension movement with your upper arms close to your body and bending only your forearms. Instead of using the lat bar, use one or two handles to simulate S-strokes. Soccer is the world's most popular sport and is passionately played on every lawn as well as any public space that will do. The game is fascinating combination of speed, technique and tactics. The athletic aspect is becoming increasingly important especially in elite level soccer, where strength training is an integral part of weekly training. Even if the sport demands primarily the legs, balanced strength training always involves the whole body. Strengthening the arm, shoulder, neck, back and chest muscles is extremely important as muscular dysbalance caused by uneven straining of muscle groups can lead to chronic injuries. The Bio Force's cable exercises are an excellent way to work all muscles needed for soccer, while strengthening your core so you can have the stability and agility the game demands. 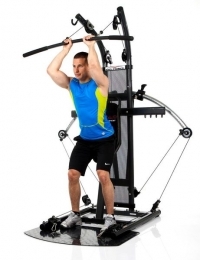 Stand in front of the Bio Force multi-gym and clip both pulleys to the bottom hooks. Place one leg on the seat and grip each handle underhand. Now tighten your core and extend both elbows until your shoulder, arms and hands are roughly shoulder-level. 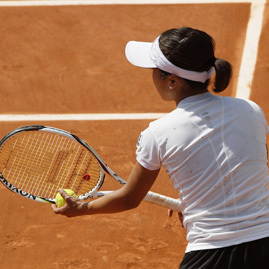 Your arms should be slightly bent, while your elbows reach highest point at final position. Briefly hold this position and then slowly lower your arms. Do the same exercise sitting or with a broad stance. There's tough, there's tougher and then there's handball. 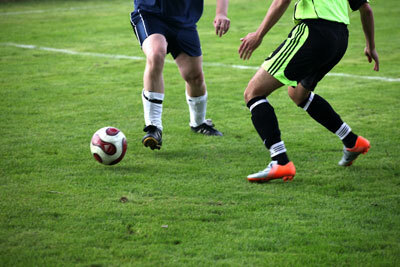 The sport has earned this reputation with its intense duels, fast attacks, powerful shots and spectacular barrage of nonstop goals. Handball players must stay extremely fit to keep up with the incredible speed, precision and hop the game demands. A strong core is key for standing your ground against your opponent. A strong shoulder girdle and powerful arms throw let you through harder and summon more performance in competition. Cross-training on the Bio Force multi-gym will provide you with whole-body fitness so you can take on this challenging sport. The cables let you target each muscle from your head to your feet, while standing exercises additionally activate your core for superior stability. Remove the seat and clip the pulleys to the bottom hooks at the base of the Bio Force multi-gym. With your back to the multi-gym, grip the handles at shoulder height and do a deep lunge. With the cables tensioned, bend your knees until your rear knee is almost touching the floor. Briefly hold this position, and then extend your legs back to starting position. Simultaneously raise your arms above your head while stretching your legs and then extend your arms all the way forward. Are you looking for a workout that strengthens all muscles, sculpts your body and is never dull? Then you want circuit training! This strenuous workout that many know from their school years is valued today as an effective power training tool. The system joins the different fitness links into a solid chain. It’s high time that its many advantages are used in home workouts. Circuit training is a strength training and conditioning program with participants completing different stations consecutively. Depending on the design and focus of a circuit training program, a certain number or reps or time is prescribed per station. It’s a rapid-fire course where you go virtually non-stop from one station to the other. And another thing. It's not over 'til it's really over. You complete one circuit and then hop back on for another. 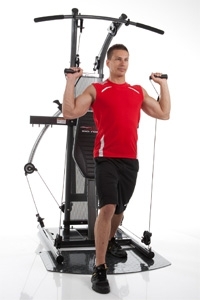 The stations are designed so that each station trains one main muscle group. The next exercise targets another muscle group, allowing the muscles you just worked to recover. Eliminating breaks keeps your heart rate consistently high, allowing the body to burn loads of calories. This way you get both strength training and cardio. Circuit training also saves you time, since you perform just a few select exercises during a training unit. Of course you can mix it up in your next session to keep your circuit training varied and challenge your muscles with new exercises. 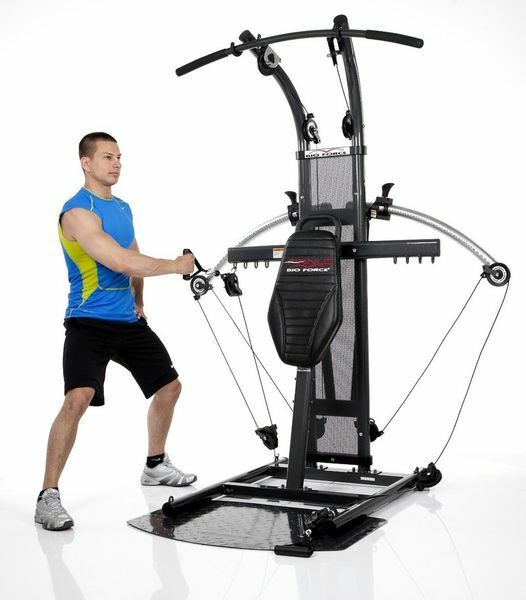 By letting you do all exercises – no matter how different they may be -, the versatile Bio Force multi-gym is flat-out the best equipment for circuit training at home. 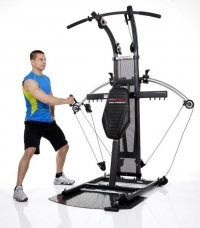 It saves you space and money that you’d spend on loads of different fitness equipment. 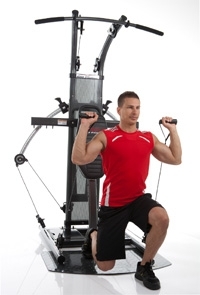 You can do your entire circuit training - arms, legs and core - just on the Bio Force. 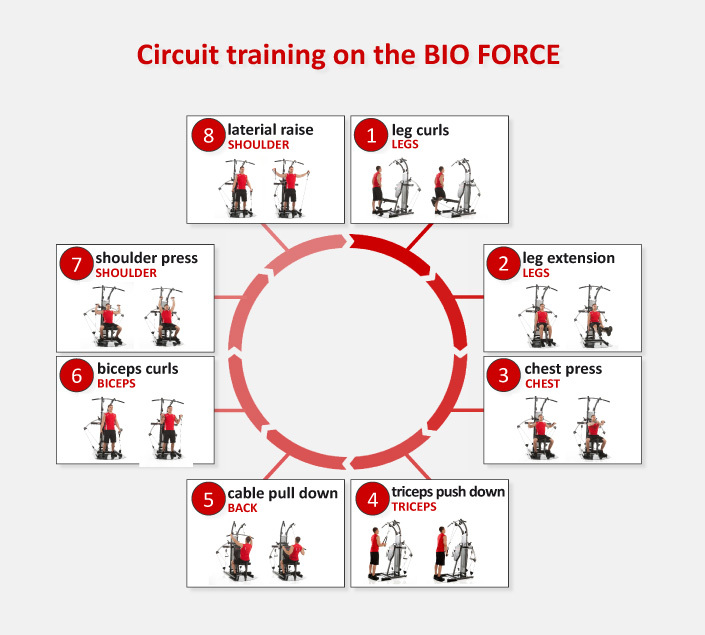 To help you get started with effective circuit training at home, we've created a sample circuit for the Bio Force. Of course you can adapt the circuit to fit your preferences and training goals. Warm up before starting the circuit to get your blood flowing and your body ready for what's to come. Jog in place for 5 minutes or use a jump rope. You can also warm up using any cardio equipment such a stationary bike or elliptical trainer. For each exercise, set resistance so that you can properly complete 15 reps. Plan 4 seconds per rep. If the exercise works just one side, then switch to 15 reps on the other side before proceeding with the next exercise. After completing the last exercise, start over again and do a total of 3 rounds. Advanced users can optionally do 5 rounds. To cool down, walk in place at a moderate pace. This lets your heart rate slowly return to normal and your muscles to rid themselves of waste products. The silently gliding TNT cylinders ensure incredibly smooth exercise motions. Finally, no more annoying clanging of weights! Whisper soft training at any time of the day or night – perfect for apartments, shift work, sleeping kids, exercising while watching TV. 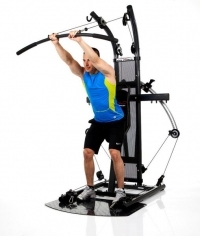 Bio Force also allows you to do your full range of motion without clanking weight stacks at the beginning and end or if you suddenly stop the exercise. The FINNLO Bio Force lets you do more than 100 exercises. 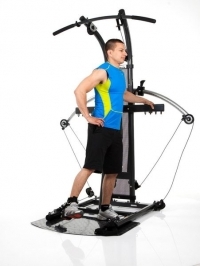 Standing, sitting, lying down, lateral, bilateral, push-pull exercises or isolated - the Bio Force is extremely versatile and lets you quickly change between exercises. Variable pulling direction and training angle mean more effective exercises. Separate resistance settings on each side let you build symmetry. Fatigue testing revealed no signs of wear even after 100,000 reps. The sealed cylinder system ensures extremely long lasting durability. Powder-coated steel tube frame, comfort cushioning with premium foam and ball bearing-mounted pulleys put the Bio Force equipment in a class by itself. 4. Changing resistance is a snap! The intuitive design lets you precisely change resistance without even leaving your seat. 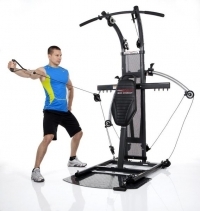 This way you can instantly change resistance - perfect for professional super sets. Rapidly changing resistance during a training sequence is key for effective and powerful muscle response. With countless exercise options, the Bio Force multi-gym does the work of an entire fitness studio, saving you not only time but money. You can train completely at home without any compromises whenever you want. Because the FINNLO Bio Force comes without conventional weight stacks it weighs just 67 or 78 kg (depending on model). With its built-in transport rollers, all you have to do is tilt the Bio Force and push it anywhere you want. It’s ideal for compact living spaces. With TNT nitrogen technology you can finally do those slow, jerk-free exercises recommended for building your strength. The extremely constant resistance facilitates coordinated and fluid movements, making it ideal for effective and low-impact strength training. The height-adjustable seat on the Bio Force multi-gym means that even large athletes can enjoy effective strength training. While lat pull-downs are often a problem on conventional strength training equipment, the Bio Force has you covered here! 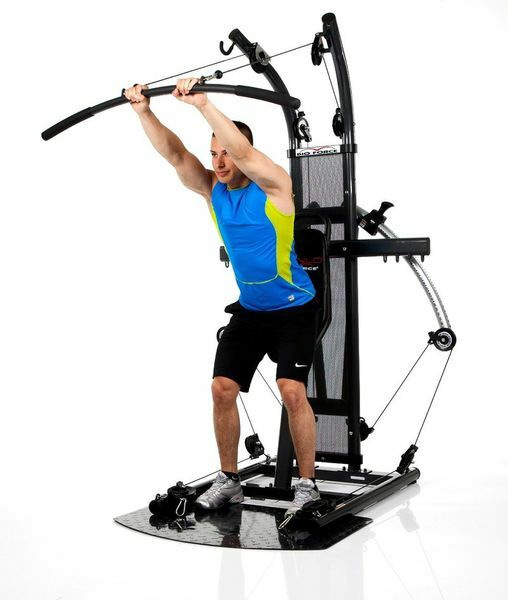 Unlike other conventional multi-gyms, the FINNLO Bio Force is equipped with bilateral cables, making training extremely functional and giving you that sought after “free weight feel”. Training angle can be varied at any time during exercise, so you can say goodbye to the limited motion of conventional multi-gyms forever. The self-contained nitrogen cylinders make the FINNLO Bio Force multi-gym exceptionally safe and let you train securely even around children. The FINNLO Bio Force is a genuine do-it-all machine! 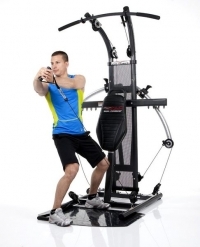 It combines proven materials and exercises with the latest space-age technology. The innovative TNT resistance system replaces heavy weights with nitrogen cylinders for virtually silent training. The system lets you fine-tune your resistance in 2.25-kg increments and fully eliminates the tedious changing of heavy weight stacks necessary on comparable machines. The intuitive slide-and-lock mechanism lets you adjust resistance up to 125 kg instantaneously. The FINNLO Bio Force offers 100+ different exercises for you to perform smoothly and without requiring tedious adjustments by combining the best classic exercises (e.g. lat pull-downs, bench press, leg extensions, etc.) and an ingenious but easy to use cable system. The result is a nearly endless supply of exercise options and variety that meet the needs of both beginners and experienced pros alike. While beginners build strength and muscle in their backs, abs, arms and legs with basic exercises, advanced users can take advantage of the countless cable training variations. Cables allow both sport-specific rotational movements and physical therapy-based joint-stabilizing exercises. Bilateral resistance adjustment forces both halves of the body to participate equally in movements, revealing incorrect movement patterns and correcting muscular dysbalance. In short, the FINNLO Bio Force sets a new standard! With its unique wealth of exercises and intuitive design that eliminates changing heavy weight stacks, it's the ideal silent training equipment for the home for both beginners and pros alike. There are many good reasons for young people to pursue regular strength and fitness training. For many, building strong muscles is top priority, while others prefer exercises that complement their sport of choice. The FINNLO Bio Force is the right choice for anyone looking to train without any compromises. 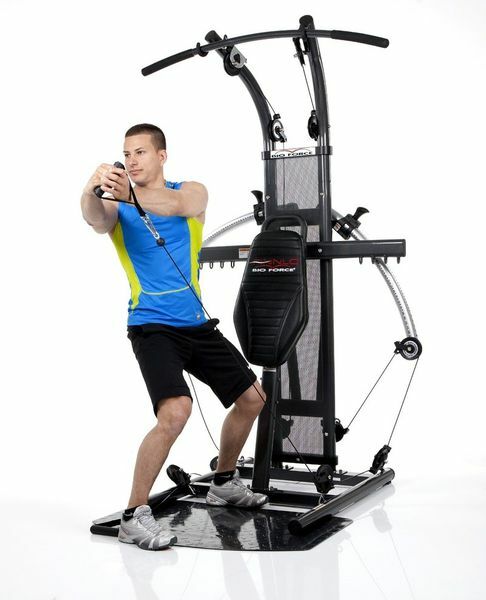 Its virtually unlimited selection of exercises (100+ different exercises) and compact design make this multi-gym the ideal all-around piece of equipment for the home. To build your muscles, get your body in shape and shed a few extra pounds, there are a few basic principles to bear in mind. Two of the most important of these principles for successful, productive strength training are regularity and variety. It’s a no-brainer that people who train regularly, reach their goals faster! For beginners 2 to 3 training units per week are optimal. This allows your muscles to slowly adapt to the increased load and gives them sufficient time to recover between sessions. What many do not know is that muscles grow primarily during regenerative phases, which occur during the night or on rest days. Therefore, it is not good for beginners to start off with five or six training units per week. The body would be completely overstrained, with symptoms of overloading, fatigue and, in the worst case, injuries being the result. It’s different for advanced athletes who already have some strength training experience (at least 6 months) under their belt. For these people, four, five or even six training units would not be a problem. Nevertheless, it's still imperative to give the muscles appropriate rest when subjecting them to so much training. "Split training plans" were created just for this reason. 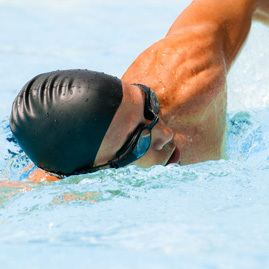 With split training, muscles are divided into two or three groups and trained on separate days. While this intensive form of training is naturally time-consuming, it’s great for those with workout equipment at home, who can divide their training into short units and efficiently integrate it into their daily routine. Physical training should not only be performed regularly, but should also be highly varied above all. Meeting this requirement normally requires many different pieces of equipment. Thanks to its integrated cable-pulling system, your training options on the FINNLO Bio Force multi-gym are virtually limitless. With way over 100 different exercises, allowing you to regularly change or vary your routine, you’ll never get bored with your training. When muscles are subjected to the same exercise again and again, they get used to the strain. This results in stagnant muscle growth and performance, referred to as plateauing, which can counteracted only through returning to a wide variety of exercises. We therefore recommend significantly changing your training plan at least every 8 weeks. This is will pose no problem as the included manual is packed full of different exercises precisely illustrated and explained. Another big advantage of the FINNLO Bio Force and its integrated cable system is that it lets you train specifically for your sport of choice. Whether you play ball, compete in track and field events or practice martial arts, the FINNLO Bio Force lets you strength train in all three dimensions. The cable-pulling system does not restrict you to linear movements such as pushing, pulling, flexing or extending, but allows you to work out with loads of different starting positions and angles. This way you can bring the handles into different pulling positions to adapt the exercises to your specific sport so you can train effectively for sport-specific motions such as throwing, shooting or stroking. Upper body rotations combined with knee flexing or core-stabilizing exercises with lunges make training function-oriented and adapted to a specific sport, helping you improve your performance and reduce your risk of injury. 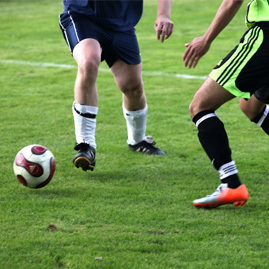 Because his body is better at withstanding the oncoming forces, a soccer player with a stable upper body is less likely to sustain an injury when fouled, for example, than an unevenly trained player. During rehabilitation, joint-stabilizing exercises can also accelerate the healing process, while reducing the risk or re-injury. It doesn’t matter whether you’re a recreational or competitive athlete or have a lot of time or are on a tight schedule, the FINNLO Bio Force multi-gym is the solution for anyone looking for a versatile and highly effective training machine for the home. 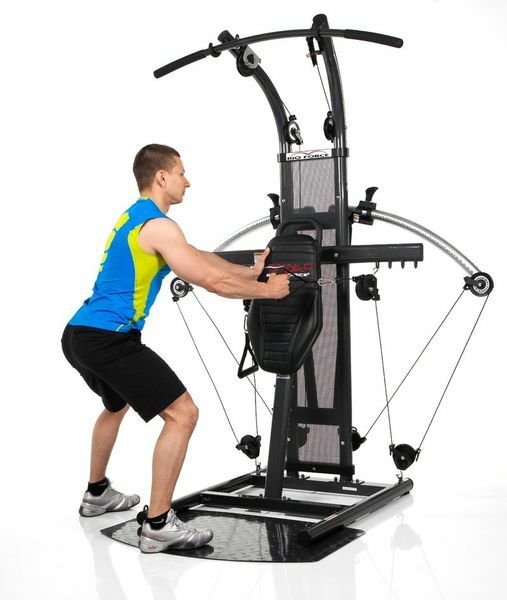 With its compact dimensions and absence of heavy weight stacks, it fits in any apartment and provides comfortable, virtually silent training. Athletes are at the peak of their physical abilities between the ages of 20 and 30. As early as the late 20s or early 30s, muscle strength starts to gradually decrease each year in athletes as well as in most people unless counteracted by appropriate strength training. The lack of intensive movement in athletic and everyday activity and later hormonal changes as well result in many cases in a gradual loss of muscle mass and thereby strength. And because each movement of the human body is facilitated by tensioning and relaxing of muscles, this process has far-reaching consequences: movements become less powerful and precise, while bones are subjected to less strain and therefore lose mass. The loss of muscle mass results in a drop in daily caloric consumption (resting metabolic rate) that is frequently the cause of a gradual weight increase when diet stays the same. It’s therefore important to nip this process at the bud. This can be done through a form of training known as primary prevention, which is aimed at lowering the risk of diseases and injuries in advance. And we have the perfect training tool - the FINNLO Bio Force. It’s the ideal all-around machine for the home. Its compact design, virtually silent operation and intuitive setup provide optimal training comfort. If that’s not enough, the integrated cable-pulling system offers an almost infinite variety of exercise, letting you customize your training. You can embark on health-oriented whole-body strength training just as easily as you can pursue goal-oriented strength training to improve your performance in your sport of choice. Healthy cross training to counteract unilateral loads in sports or everyday life is also no problem on the FINNLO Bio Force multi-gym with its 100+ exercise options and bilateral resistance control. In addition to the gradual loss of muscle mass and strength already addressed, the body also undergoes several other changes. In many people the job stress and lower activity level in their 40s combine to raise their blood pressure, cholesterol and/or resting heart rate. It’s a proven fact, however, that adequate exercise frequently has a positive influence on these three parameters. Elevated blood pressure can be returned to normal through “soft” strength training with lots of reps, low resistance and proper breathing technique. Elevated cholesterol, which is frequently a symptom of not enough physical activity and the wrong diet, generally drops with the right amount of exercise. A long term rise in resting heart rate can be caused by many factors. It can generally be attributed to either poor endurance, i.e. the cardiovascular system’s inability to adequately supply the body with blood and oxygen, or simply long-term elevated stress level. This is where strength training on the FINNLO Bio Force can also help. The ability to escape from your daily routine in a workout or to end a stressful day with a convenient, hassle-free training unit at home helps clear your head. Above all, strength training releases a host of hormones that leave you feeling good and make your body more resistant to stress. As a result you'll be better equipped to meet the challenges of your job or daily routine, and your body will be stronger and more capable. To ensure good health and a well-functioning body even later in life it's necessary to incorporate regular strength training into your life as early as possible to retain muscle strength, reduce stress and increase the body’s resistance. Cycling, swimming or Nordic walking – these are some of the most popular recreational activities especially among seniors. They enjoy the reputation of improving your health and helping you feel better. While pursuing these activities undoubtedly has many positive effects, each lacks one critical factor – strength! In addition to endurance training, which keeps the cardiovascular system fit, performing regular strength training is an important key for remaining fit and capable especially during your later years. Despite the subjective impression that swimming or biking strengthens muscles, these sports very rarely provide the adequate stimulation necessary for significantly increasing muscle power. With strength training, it’s a different story. Performing properly prescribed strength training exhausts the muscles so much that they're built up even stronger after a short regenerative phase. Regular endurance training should therefore always be combined with regular strength training especially in your later years. This is where the FINNLO Bio Force excels above all! This training tool for the home combines all the positives for optimal strength training. Instead of conventional heavy weight stacks, the FINNLO Bio Force uses nitrogen cylinders that let you fine-tune resistance level. The simple slide-and-lock mechanism can be operated with a single hand and eliminates the tedious process of changing weights. Plus, training is virtually silent, making the Bio Force your best choice for the home. Integrated cable-pulling system makes way over 100 different exercises possible, which are all clearly illustrated and explained in the included manual, ensuring that your training will never just stay the same. The loads of different exercise options also let you adapt your training precisely to your individual needs. This way you can embark on a health-oriented program to strengthen all of your muscles just as easily as you can start a wide range of physical therapy exercises. The primary goal of strength training in your later years should be to improve or retain muscle strength, since strong muscles are the alpha and omega of coping with everyday challenges. Standing up from a dining chair, carrying shopping bags up four flights of stairs or lifting heavy objects over your head undoubtedly place heavy strains on your muscles, tendons and joints. This is where strength training can also help. Stronger muscles increase tension on tendons and bones, which can stop or even reverse the aging-related loss of bone mass known as osteoporosis. This way bones become strong and resilient again. Additionally, the ability to maintain balance is determined in large part by strong leg muscles. Strength training plays a key role in preventing falls by promoting the body’s ability to execute evasive maneuvers and catch itself. Regular strength training is thus plays an important role in injury and disease prevention and helps promote long-lasting health. It’s not just the immediate effects that make regular strength training such a potent tool. It’s also highly valued by doctors and health experts for its role in weight reduction, where it forms a one-two punch with diet change. Adding muscle mass increases resting metabolism, i.e. the amount of energy the body consumes during rest. Added muscle elevates activity level, thereby increasing caloric consumption. This makes regular training on the FINNLO Bio Force multi-gym the right choice for anyone who wants to lose weight and above all keep it off permanently. For many women, a slim, toned body is a beauty ideal and is frequently their training goal. But what exactly does "body toning" entail? There are two parts. First, body toning involves reducing body fat percentage, with the subcutaneous fat, i.e. fat directly below the skin, being the focus. However, fat reduction alone is not enough. This would give you a lean, but not toned body. Strengthening your muscles is therefore an essential and indispensable part of body toning that should not be neglected. Strong muscles make the whole body “tighter”. This realization has really caught on, evidenced by the increasing number of women incorporating regular strength training in their daily routine. Adding lean body mass through strength training also increases resting metabolism, allowing the body to burn more calories than before even during rest. For this reason, doctors and health experts alike recommend adding regular strength training to your regimen for lasting and stable weight loss. However, many women still believe that training on bulky machines with heavy weights is no fun and is not suited for most women's fitness goals. It doesn't have to be like this. With 100+ exercise options, the FINNLO Bio Force is guaranteed to keep your training varied and help you meet your goals. The integrated cable-pulling system makes this variety possible. 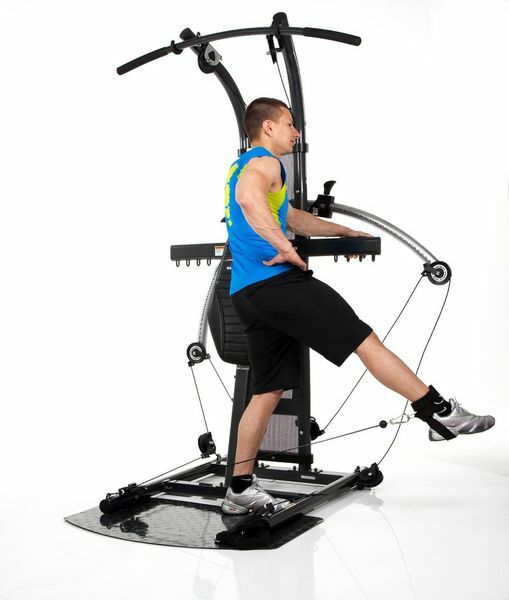 The FINNLO Bio Force makes the monotonous and one-dimensional movements of most machine exercises a thing of the past. Instead it lets you attach the handles to countless positions so you can move in all dimensions. This makes your training much more free and body-sculpting and lets you adapt it precisely to fit your goals. Fun and motivation will increase, and you’ll see results. Are you looking for tight glutes, slender legs or strong arms? No problem with the FINNLO Bio Force and the cable exercises illustrated in the included handbook! Another major plus of the FINNLO Bio Force is its innovative TNT resistance system. This technology replaces heavy weight stacks with nitrogen-charged cylinders that allow you to easily fine-tune training resistance in 2.25-kg increments. The intuitive slide-and-lock mechanism makes changing resistance a snap, eliminating the tedious task of changing heavy weights and saving you time better devoted to training. Of course, training isn’t just for looks. Strength training also has a lot of health benefits that you’ll definitely see. In addition to improving various bodily parameters such as resting heart rate, cholesterol level or blood pressure, regular strength training is critical for postmenopausal women. During menopause, a woman's estrogen level drops, while the body simultaneously loses calcium, which is stored primarily in the bones. Doctors estimate that roughly 30% of all postmenopausal women are affected by this trend, causing them to continuously lose bone density. Known as osteoporosis, this process can have unpleasant consequences such as significantly elevated risk of fracture (hip fracture), postural problems and chronic back pain. The good news: Properly prescribed strength training on the Bio Force multi-gym can counteract this process. When subjected to intensive loads through strength training, bones come back stronger and denser than ever. Of course, it’s always best to start training as early as possible before you experience any significant bone loss at all. In addition to having aesthetic and health benefits, regular training will help you feel better all around. Intensive training releases different hormones (e.g. serotonin) that leave you feeling good and increase your resistance to stress, benefitting your body tremendously. You’ll have more strength and energy, feel better mentally and physically and be more active.